Modern human, Homo sapiens, evolves in Africa. The change in the inclination of the Earth’s axis and the changing shape of the Earth’s orbit causes climate to vary in 40 000–100 000 year cycles. The glaciation accelerates the evolutionary process. The species of modern humans, Homo sapiens, developed in Africa some 200 000 years ago. The Homo species already had a long developmental history behind it, and at this time there was still several species that belonged to it. The lines of humans and chimpanzees had diversed about 6 million years ago, when the Eastern Africa was drying up to savannah. 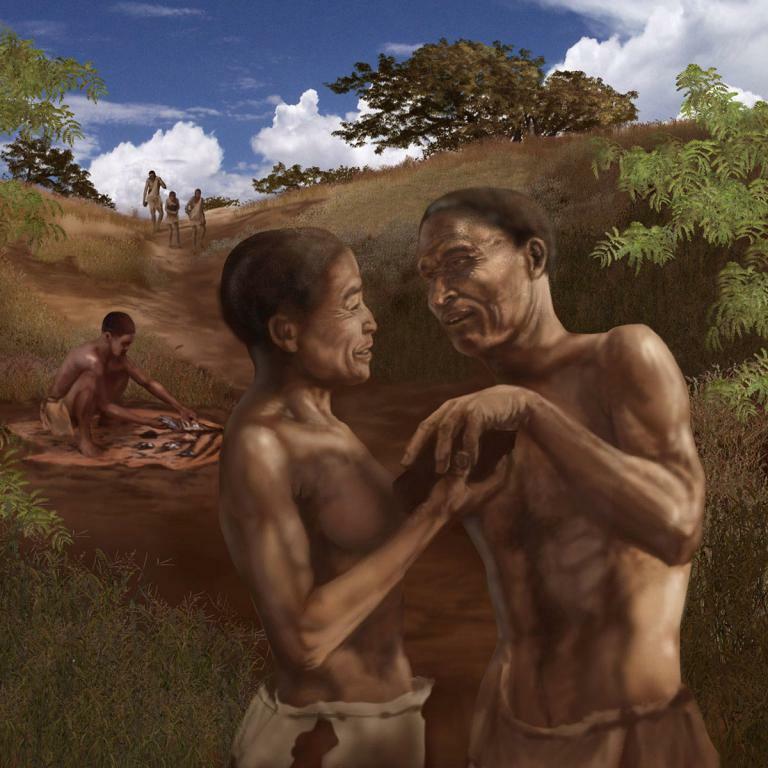 The up-right walking position was beneficial on the open savannah, and Ardipithecus ramidus, who lived about 4 million years ago, was already moving fluently both on two feet, and by climbing. Walking on two feet freed the hands for other tasks, and there are signs that Australopithecus garhi was already able to make and use tools. The genus Homo appeared about 2,5 – 2 million years, as the current age of glaciations started. One of the most central species was Homo erectus. In Africa this species developed into modern human, and in Europe, it developed into the Homo neanderdalis. In Asia, this developed, further on, to Homo denisovan. These parallel species have interbred with the humans, and they have disappeared only some tens of thousands years ago, as the modern humans migrated out of Africa. Besides the large climate changes, human evolution have been driven by the feedback cycle of the development of the larger brain, and the increasing capabilities. Efficient walking technique, increasingly complex social communication, improving tools and developement of cooking skills improved the availability of food. This allowed increase in the size of the energy-hungry brains, which further improved the capabilities and thus the nutritional status. The developement of large brain, however, required long childhood, which gave time to learn increasingly complex skills. Also the life span was increasing and grand-parents were able to free young adult for food gathering. These different factors were likely to develope in parallel, and depended from one another. But this development was not entirely unique to the modern human. For instance, also the Neanderthal man was able to speak, make complicated tools, and apparently, even to create art. Genetically, however, our species did not change very much: The genomic sequences of humans and chimpanzees differ only by 1 %. The most important differences between human and chimpanzees occur in six specific genes, which are related to the development of the brain, production of the speech, structure of the hand, and digestion – i.e., those features which make humans to be humans. Hominin evolution. Various hominin species were living simultaneously. Different genera are shown with different colours. Image: Wikipedia. Pleistocene epoch 2.6 million – 10 700 years ago is the first part of the current Quaternary Period. Queaternary is characterized by the cyclic growth and decay of continental ice sheets in northern hemisphere in about 40 000 – 100 000 years cycles. These glacial-interglacial cycles are due to the changes in Earth axis and orbit in every 41 000 years (Milancovic cycles) and by the ability of snow to reflect solar radiation and thus accelerate the cooling. Glaciations bind a lot of water, causing the sea levels to sink by 120-150 meters. During the interglacial periods sealevels rise again. Thus new connections between continents and islands are formed during glaciations and separated during interglacials, for example Bering strait between Eurasia and North-America, which can affect distribution of species. Glacial-interglacial cycles accelerates evolution, but also caused extinctions. The glaciations had global effects on living conditions, although the effect was largest in the northern hemisphere. The human evolution was fast during the Pleistocene and various Homo species evolved, including modern human 200 00 years ago and cultural evolution started. Even flora and fauna were rather modern, also many now extinct animals were living in Pleistocene, suchs as mammoth, mastodont, sabretoothcat and giant sloth. 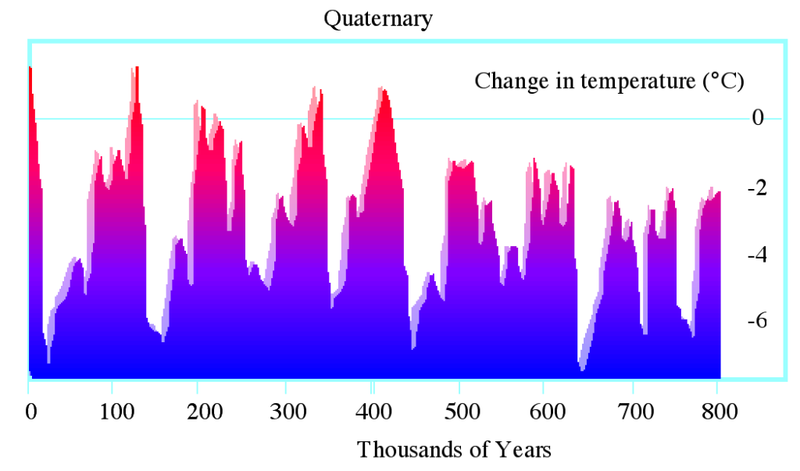 Pleistocene ended when the current interglacial started 10 700 years ago.